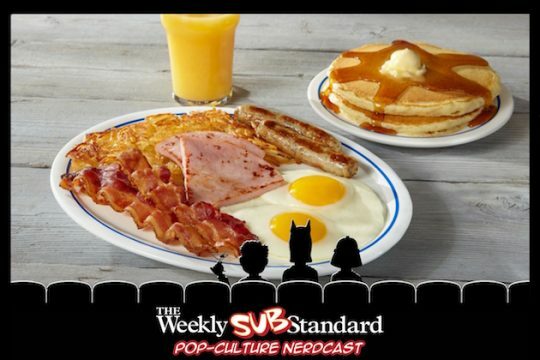 In this latest hodgepodge episode of the Substandard (subscribe, tell your friends, leave a review), Sonny, JVL, and I discuss the impending "Big Game," the impending Disney-Fox merger, and the not-so-impending Substandard episode broadcast from the Wynn in Las Vegas (see, told you it was a hodgepodge). I suggested a show broadcast live from Olympic Gardens, but my cohosts pretended not to know what that is. We agreed we would love to do a show in Las Vegas—from the Wynn. Sonny recounts the time he did not cash in his winning bet. I mention the old Imperial Palace and late owner Ralph Ingelstad having the "Reich stuff" as the Las Vegas Sun reported at the time of his death in 2002: "Engelstad had held parties in the resort's secret multimillion-dollar Nazi memorabilia room allegedly to observe Adolf Hitler's birthdays in 1986 and 1988. Engelstad later denounced Hitler, apologized for his error in judgement and emptied the room of Nazi memorabilia." As for Disney-Fox, JVL has very deep thoughts on how this could impact the Marvel Universe. Will we finally have a definitive Fantastic Four movie? Will the X-Men finally team up with the Avengers? JVL's anecdote about the James Cameron psychosexual coming-of-age Spider-Man is "amazing"! We take a detour (one of many) and discuss my father's DVD collection and his penchant for labeling things. Why he put his home address label on the Sucker Punch DVD remains a mystery. More to the point, we get into the Lord of the Rings trilogy, which my son completed watching (the books arrive at our house today!). JVL asks if my son prefers Legolas or Gimli. The answer is the Witch King of Angmar. My bathroom is done but some fears remain. What of the creature that stirred beneath? I make a reference to Ghoulies II. Click here but don't say I didn't warn you! You might want to be sitting before you watch—or maybe not! And finally, on a much happier note, we end with a conversation about the IHOP breakfast sampler. Sonny and I agree it's the best. JVL would agree too, if only he ate bacon.